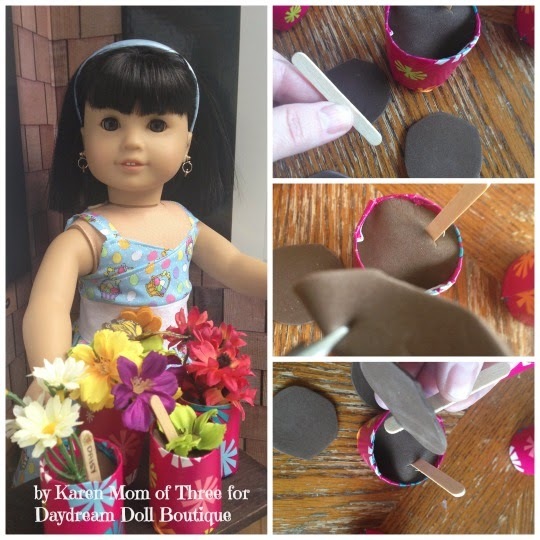 It is Spring and this Make I Monday Post features easy to make doll sized planters you can make for your own doll. You can fill them with flowers or leave them as fun pots! * watering can and "potting bench" from Michael's the craft store. Step 1- Gather all your supplies and cut your toilet tubes in half as shown in the photo above. Step 2- Use a glue stick and run a line of glue over the wide edge of your toilet tissue roll, leaving one edge of the paper long so you can tuck it up the bottom of your pot. 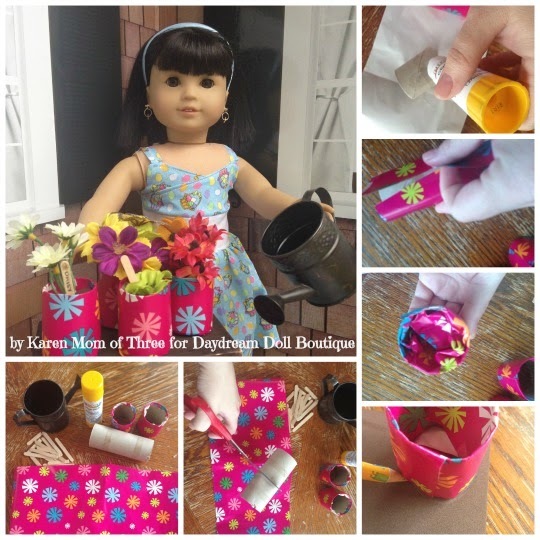 Wrap your paper around the tube. Cut and glue the end into place and fold over the edges. Do this for all your pots. Step 3- Place the covered tube on top of your brown fun foam use a pencil crayon and trace the shape of your pot. Cut the fun foam out. Repeat for all your doll pots. Step 4- Use your scissors and make a snip in the circle of your fun foam as shown in the photo above this is where you will slide your plant marker into place. Step 5- Cut a small bunch of flowers from your dollar store flowers and cut a hole to slide them in through the fun foam as well. 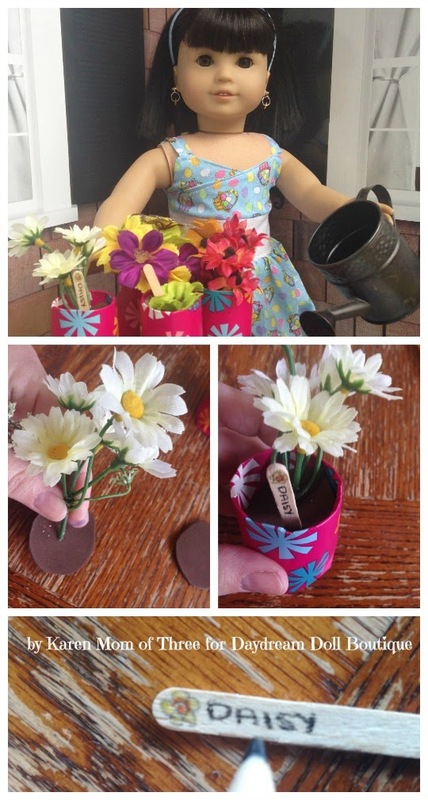 Step 6- Make Plant Markers and use your pencil crayons to personalize your pot markers. Repeat on all your doll pots. 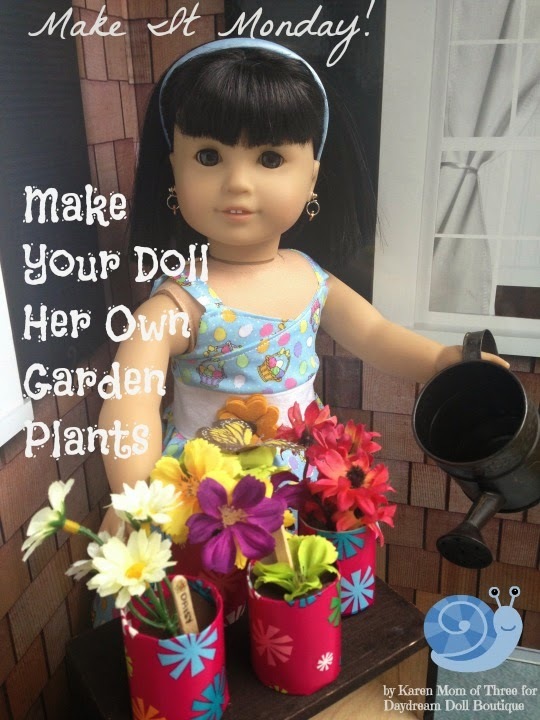 I hope you enjoyed today's Make It Monday Post and I look forward to sharing more doll play ideas with you again soon.